This topic contains 11 replies, has 7 voices, and was last updated by Bob 1 year ago. After this firmware upgrade, the RLC-423 camera no longer works. I believe this firmware might be specifically for the 4MP version of the RLC-423, and I have the 5MP version of the RLC-423. Can anyone confirm that this indeed might be the problem? Is there a fix for this? There does not seem to be ANY firmware specifically for the 5MP version of the RLC-423 available on the Reolink website. I’m dead in the water until this can be resolved. Thanks for any help anyone is able to provide. I would contact Reolink Support. I do not want to speak for them but I just got a reply from them regarding this issue. The firmware that came with the camera was 17120705 “is up to date, but it seems the factory test version”. They are contacting R&D and I believe they hope to have it figured out sometime tomorrow. I wish I could send you a copy of the old firmware but I do not think it is possible. We will finish the test of firmware for 5MP RLC-423 and upload it to our website very soon. The same happens with my new RLC-423 5MP camera. I’m waiting for the new firmware that my device works fine again. Or can I download the old firmware from anywhere. The factory reset does’t work. Unfortunately I also have the same situation. After “upgrade”, the camera was in a continuous “boot loop”. After a power cycle/reset, I was able to communicate with the camera again, but no video. Hopefully the video will be restored with the correct version. Hi I just updated the firmware on my RLC-423 5MP camera and now it wont focus well at all. The camera tries to focus (it is on auto focus) but it still produces a blurry image. I have the camera set on ‘Clear” so that’s not the problem either. I’ve been through every setting and am convinced that the new firmware messed up the focus badly. Please, where can i download a previous version of the firmware so i can fix my camera focus. The “upgrade” made a once awesome camera terrible. Where is the Firmware for the RLC-423 5MP? 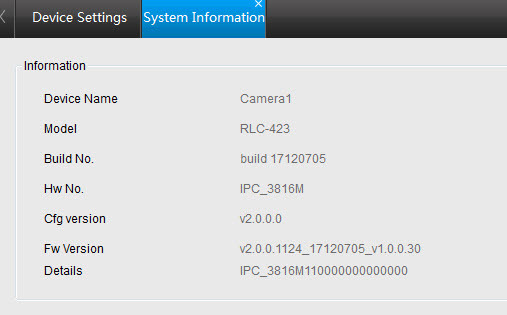 There is a Firmware File –> IPC_3816M.843_17061508.RLC-423.ov4689.4MP.PTZ.REOLINK.pak <– for the 4MP RLC-423 Camera. OK, on the Engish Website is the Version from the 4MP and 5MP Version and on the German Website is only the 4MP Version. That is confusing for an old German Man! Sorry for this issue. We was slow on updating the pages. Now issues fixed.